Alice Wheeldon had three daughters (Nellie, Hettie, and Winnie) and a son (William). Alice had a shop selling second-hand clothes in Derby and the family lived on the premises. The family was known as supportive towards young men opposed to conscription during World War One. William was a conscientious objector and, in August 1916, he was sent to prison for a month for 'obstructing' the police who were moving five conscientious objectors from prison to the railway station. William later went on the run from the authorities. Alice was a suffragist and socialist, active on the left of the local Independent Labour Party and in the Women's Social and Political Union (WSPU). World War One divided both socialists and suffragists. Being opposed to the war, Alice left the WSPU because of its support for conscription and, with two of her daughters and her son, she joined the No-Conscription Fellowship. Alice, Hettie and Winnie also joined the Women's Peace Army set up by Sylvia Pankhurst and Charlotte Despard advocating a negotiated peace. The family unsurprisingly attracted the attention of the authorities. In December 1916, a man calling himself Alexander Gordon came to the Wheeldon home, claiming to be a conscientious objector on the run. Alice arranged for shelter for him at a nearby friend's house. Gordon returned with Herbert Booth claiming to be an army deserter. Both were undercover agents working for PMS2, a section of MI5, and a treasonable plot had been concocted. Gordon told Alice that the work camps for conscientious objectors were guarded by dogs, and the two also told Alice that there were ways of getting conscientious objectors out of the country. Alice's son William was by this time on the run. A few days later some packages of poison posted to the Wheeldon house were 'intercepted' by the authorities. It was claimed that the poisons were to be used to kill guard dogs at the work camps. On 30 January 1917 four members of the Wheeldon family were arrested (Alice, Hettie, Winnie, and Alice's son-in-law Alfred Mason). The charges were eventually escalated to conspiracy to murder the Liberal wartime prime minister David Lloyd George, and the Labour cabinet minster Arthur Henderson. The initial hearing was held at the Derby Guildhall. This was attended by the attorney general F E Smith, the MP for Liverpool Walton formerly in charge of censorship and pro-war propaganda. Smith ordered the trial to be held in London at the Old Bailey. There was much public interest as the trial began on 6 March 1917. As the trial began Smith, who was prosecuting, described the accused as "...a gang of desperate persons poisoned by revolutionary doctrines and possessed of complete and unreasonable contempt for their country." A Sunday Pictorial headline ran, "Sensation in Derby conspiracy case - poison darts for Premier!". This was a reference to the claim by the prosecution that poisoned darts were to be fired at Lloyd George, while he was playing golf, in an attempt to assassinate him. The government was eager to disgrace the anti-war movement. The prosecution evidence was flimsy and Smith refused to have Gordon called as a witness, or have his true name revealed, or give his whereabouts. Therefore Gordon could not be questioned or cross-examined by the defence counsel in court. Three of the four accused were found guilty. Alice Wheeldon was given ten years penal servitude and sent to Aylesbury prison, where she went on hunger strike and was later moved on to Holloway prison. Alfred Mason (son-in-law) was given seven years and Winnie Mason received five years. The jury asked for leniency for the youngest two on account of their ages. Hettie was found not guilty. Three days after the conviction, the Amalgamated Society of Engineers union published an open letter to the Home Secretary demanding that the police spies involved be put in the witness box to see if there might be fresh evidence. The request was refused. So who was Alexander Gordon? His real name was William Rickard and he was employed by MI5 two years after his release from Broadmoor Prison Mental Hospital. He was a convicted blackmailer and had twice been declared 'criminally insane'. Dr Nicholas Hiley of Kent University has researched the case and says that Rickard was an 'unbalanced fantasist' and 'spectacularly unreliable'. He was from a section of MI5 under threat of closure and so a plot was fabricated. MI5 records released 80 years later suggest evidence of entrapment and false statements. All of these events must be seen against the background of World War One. By 1916-17 there had been a huge loss of life and the government introduced compulsory military conscription. The number of conscientious objectors increased during the war and there was a growth of anti-war feeling. MI5 focused on political opposition to the war with agents everywhere and surveillance of pacifists, Marxists, socialists, suffragists, feminists, agitators and trade unionists. In addition the unfolding events of the revolution in Russia and fear of more widespread Bolshevik activity acted as a further spur to this surveillance activity. At the end of December 1917 Alice Wheeldon was released from prison 'on licence' at the request of Lloyd George, who obviously had no wish to see Alice die a martyr. In very poor health she died just over a year later, a victim of the worldwide influenza epidemic. At her funeral, Alice's son William covered the coffin with a red flag. William joined the Communist Party in 1920, emigrated to the Soviet Union in 1921 and became a Soviet citizen in 1926. On Christmas Day 1937 he was shot during Stalinist purges as a suspected supporter of Trotsky. 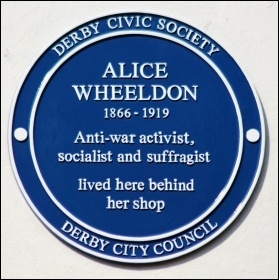 In 2013, following a local campaign and renewed interest in the case, Derby city council and Derby Civic Society erected a blue plaque as a memorial to Alice at the site of her home. 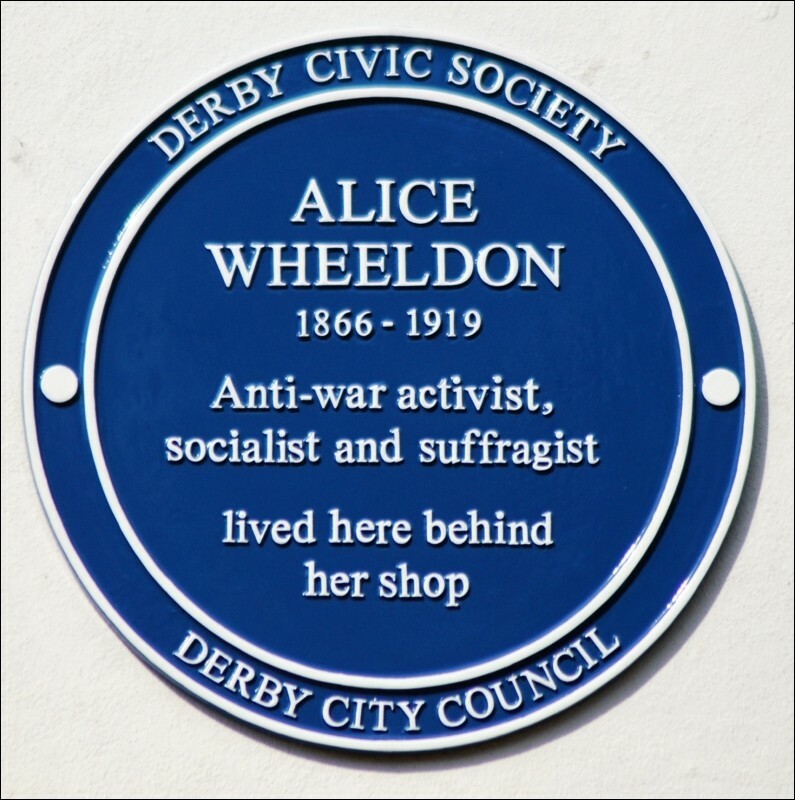 It states: 'Alice Wheeldon, 1866-1919, Anti-war activist socialist and suffragist lived here behindher shop'. It might also have said: 'Suffered injustice and persecution for her views at the hands of the British state'.